Who says a night in can’t be fabulous? When you have small children, getting out for a night on the town with your significant other can be nearly impossible. It can be a headache to arrange for a babysitter and the date itself can be costly — movies are screamingly expensive and restaurants can really thin your wallet, too. Use these ideas to keep your relationship exciting and get some valuable one-on-one time. To keep your date night child free, you have a couple of options. First, you might ask grandma to come over to watch your child in a different part of the house so you and your partner can enjoy some time alone. Or, if your child is usually in bed before 8 or 9 o’clock, go about your usual routine. Once your little one is tucked in, you can get your romantic night off to a great start. Don’t forget to change out of that robe and slippers! Pretend you really are going out and wear grown-up clothes and a little makeup. Now, check out these five ideas for a hot night — in your house! Turn your kitchen and dining area into the restaurant of your dreams. Set the table with dishes that never see the light of day and bust out that awesome tablecloth your Aunt Hattie gave you for your wedding. A few candles or creative lamplight will complete the mood. For the menu, prepare your and your partner’s favorite cuisine or try something new. If you have time you can go all out — but with the proper setting, the food may not matter! For many parents, watching a movie uninterrupted is a rare treat. Forget the crowds and bring the cinema home! There are many ways to rent movies now — from traditional DVD rental stores to discount options like RedBox and even instant methods like NetFlix on your video game console. Queue up a new release or pop in an old favorite, like the one you saw on your first date. Have plenty of your favorite munchies or keep it healthy with a veggie tray and low-fat dip. Want a way to show appreciation for your honey while getting pampered? Create a mini-spa! Set the mood with scented candles and freshly-laundered robes. Take a shower or bath together, then break out your best lotions and body scrubs and get busy massaging. Take turns and don’t be shy — ask for what you want. Add a tray of fruit and a glass of wine and you’ll soon forget you’re even at home! Think games are just for kids? Think again! Settle down with a game of Scrabble, Trivial Pursuit or even Monopoly. You could also play video games on your Wii or Xbox. To up the ante, hedge bets on your play — best two out of three gets to sleep in tomorrow, or the loser has to do laundry. You can even turn it naughty by playing Spin the Bottle. Combine these ideas into a theme night. How about a baseball theme with A League of Their Own, turkey dogs and veggie chips, a baseball video game and wearing your partner’s old jersey? Or how about a country night with bar-b-que, a few good westerns and cowgirl clothes? You can also think of your favorite movies and what the characters wear and eat — who knows what a Pretty Woman night might bring? 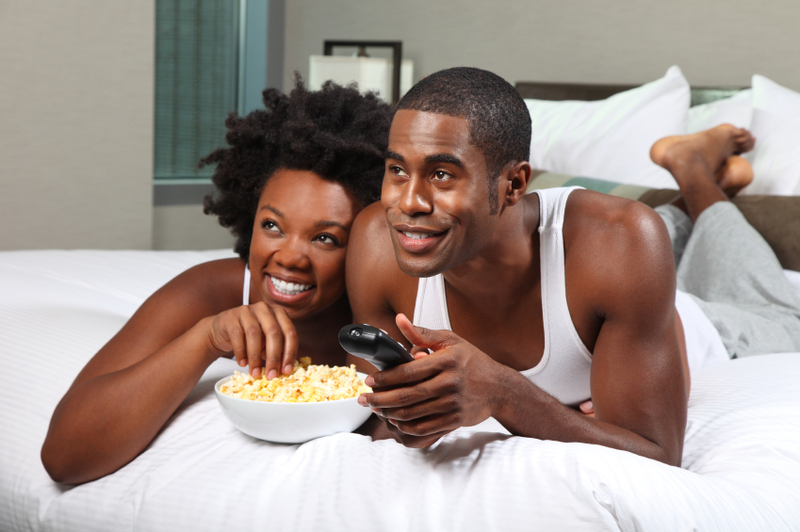 >>Do you have date nights at home? Share your fun date night ideas in the comments section below.